As I understand it, perspicaceous means, not keen in the sense of being eager to get on with something but the keen (sharp) mind that has the ability to see deeply into a matter, to understand its implications. But that in no way applies to my solving your puzzle pic., Yves! The trouble is, Google has got so adept at linking even a simple, childish phrase to a variety of possible solutions that it leaves no opportunity for us poor puzzlers to use a bit of brainpower or reasoning. However, hopefully this photo will be sufficiently anonymous-looking to hold you up for a short while. What and where is it? Last edited by wherrygirl; December 13th, 2015, 23:30. First question:are we in Europe? OK.I search this twin towers church in America without any success.Is it the right continent? No, Yves. Wa-hey, this has lasted almost a day! So my guess is it is some sort of Wedding Chapel and maybe in South Africa?? And my answer to you, Yves, is that staying or leaving remains a decision only you can make, but you won't get any further if you stay. "And it is not in South Africa. (Study each word in that sentence. ) "
Not in South Africa. But close. Ouch, the frying pan is out!! I thought that since you hadn't erased the crosses it probably wasn't a Church in the true sense. I also though it looked somewhat Dutch in style, hence South Africa. Sigve, you have picked up on the significant word, well done. Yes, it is close - on a global scale, that is. I did consider it, Ombugge, but decided not to be quite so heartless. Even without them it would still have looked religious, anyway. But Namibia, no, afraid not. I never spent so long time in Africa.And in churches as well. Take to the water, Yves. Interestingly Ivy, when I've said or done something wrong (I'm a man, it happens quite frequently), Mrs PoloUK tells me to 'hopp i havet' (jump in the sea). I assume you weren't using the same tone of voice for poor Yves? I reckon Nari's comment to your previous post is going in the right direction though. Nari, not quite, but you are in the right area. 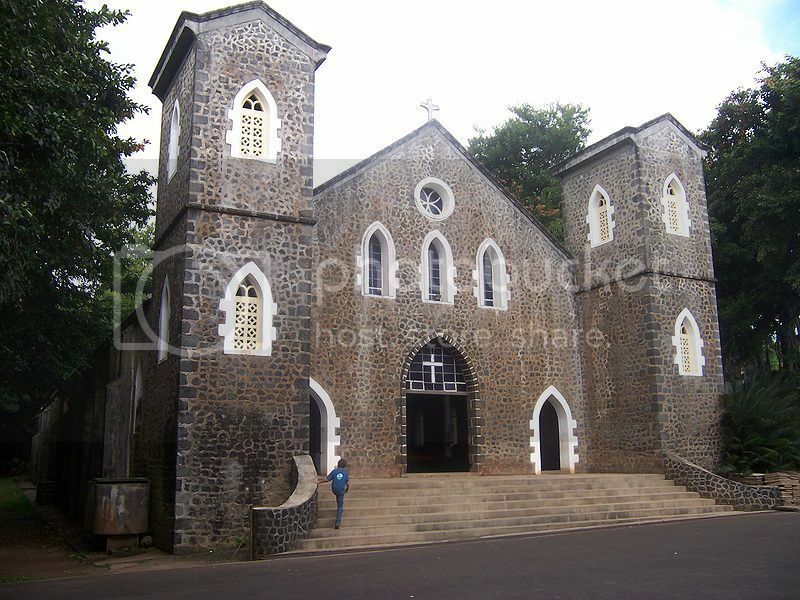 There are a number of very similar churches in the Seychelles but not this one.